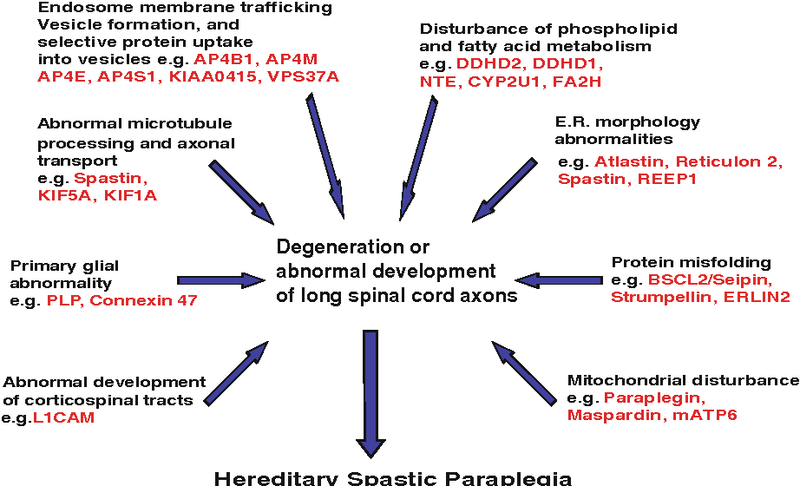 Hereditary spastic paraplegia is a hereditary disorder in which lower extremities are affected. HSP is not a single disease entity. It is characterized mainly by lower extremity weakness and spasticity. Studies conducted showed degeneration of corticospinal tract axons. Strumpell first described HSP in 1883. 6)spastic paraplegia associated with additional neurologic and systemic abnormalities. The most useful classifications now are based on the mode of inheritance and genetic linkage.HSP is clinically & genetically heterogeneous.”Pure” autosomal dominant HSP is most common and even this is heterogeneous with eight loci identified. With regard to pure, autosomal dominant HSP, SPG4, SPG3A, SPG6 accounts for 70-80% of families. SPG4 HSP is the single most common dominantly inherited HSP. X linked HSP is complex but rare. In past HSP was also classified as type I or type II, based on the patient’s age at the onset of symptoms and on the amount of spasticity versus weakness. Because both types can appear in the same family, this classification is no longer used. In patients with pure HSP, life expectancy is unaffected. Generalizations about the life expectancy of people with complicated HSP are difficult to make because each patient has unique symptoms.